APD yields 2.60% when I bought it. I bought 6 shares so around $1014. APD just raised its dividend a massive 16%. They also just announced earnings. The guidance going forward was boosted as expected due to tax changes. Revenue was up 18% Y/Y. And they beat by 14cents out of 1.79$ which is impressive. The shares were down 2.75% when I bought them so I took the opportunity to add more to a dividend aristocrat after a beat and raise, I never can understand the logic or moves of the market. I bought JNJ after the 4% dip when announcing earnings. I felt the report was good and JNJ continues to excel, as usual. One of the highest quality companies on Earth. AAA balance sheet. I added 9 shares at around $142 or $1278 total. I'm a little late with my 2017 year end portfolio summary post. So I will post using data as of today. My portfolio is growing and 2017 was a very healthy year for the market. New policies from the new Trump administration have benefited businesses. From lower regulation, repatriation, and lower corporate taxes, the stock market is surging to all time highs. The cyclical business names are on fire and rising every day, it is nearly impossible to buy these types of companies at fair prices anymore. The more defensive sectors have not run as quickly but have benefited no doubt. Due to the growth in 2017 of all sectors, my portfolio has reached all time highs. Buying companies at previous old price target numbers is now impossible. Almost everything is expensive and I have to now re-calibrate my price targets with future outlook in mind, since most American companies are now having huge tailwinds from the tax cut. The economy of the world has also grown very nicely in 2017 and the outlook for 2018 is positive, which fuels the growth. For 2018 I am expecting higher dividend raises due to the lower tax rates and repatriation and more buybacks to fuel earnings per share growth. Also for 2018, I am expecting rates to go up as the Fed is going to have to start hiking due to all the growth in the economy. As rates go up, I expect high yielders and debt heavy industries like Utilities and REITs will see their prices fall (although utilities I have to say will benefit a lot from the reduced tax rate from high 30%s to low 20%s), presenting good buying opportunities. In 2018, I am expecting my portfolio's average yield to go down. It has already moved from an average of 3.0% yield when I started to 2.5% right now. As prices rise above the rate of dividend payout increases, the yields start to fall which makes me sad because each of my stock purchases in 2018 won't be able to contribute so much dollar in income as they used to. I will start off with a chart of the S&P500 this year. The chart is quite incredible. Although I am more after the income stream my investments can generate for me, I cannot lie and say I am not enjoying the large rise of my assets on paper. 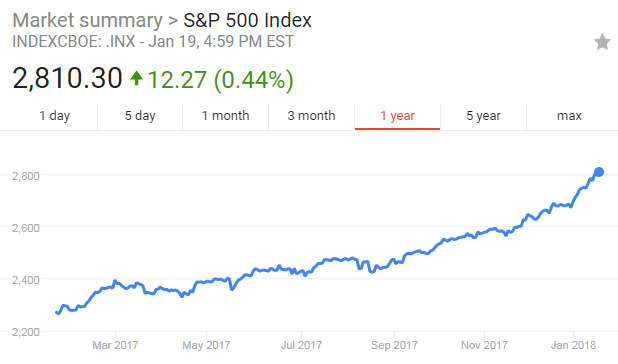 From the chart above (Jan 20 2017 to Jan 19 2018), the S&P500 has gained a massive 24% and this does not even include the dividends. Bought $600 of D and $500 of XEL today. Utilities seem to be undergoing a sector rotation and are getting cheaper. D is offering to buy Scana, which caused its share price to lower. I think an acquisition here will really help increase D's earnings growth profile further which will support the dividend growth. The initial cost will be a hit though. December was a decent month for dividends. I got $959 from a wide range of companies. TJX usually pays in December but for this quarter they paid in late November for some reason. 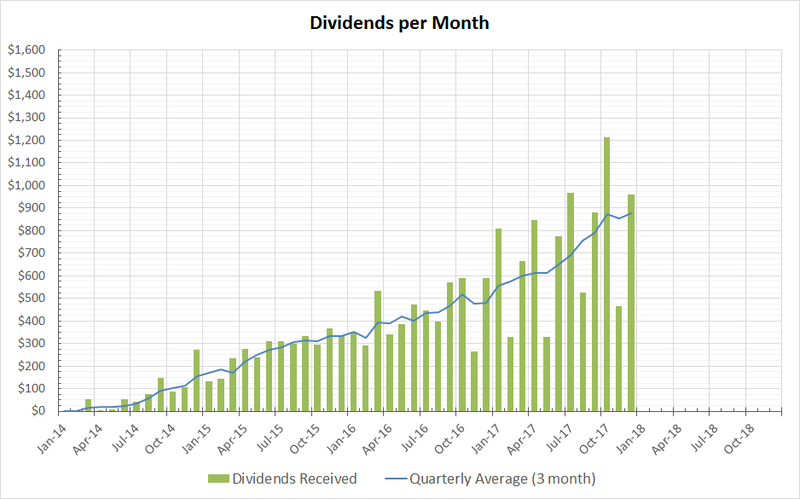 I think for March 2018, my dividends from this quarter cycle will be over $1000 in monthly dividends. For the coming January I am expecting somewhere in the high $1100 in dividends. And February around $500.